Highly visual, orange rubber handle is easy to spot + grip. Replaceable razor blade is safely switched out w/ the push of a button. Don't be without it on the big hunt. Gerber’s hunting savvy combined with our exchangeable razor blade history has produced the Vital Pocket Folder EAB Knife, featuring one of the safest Exchange-A-Blade options on the market. With a punishingly sharp blade that mimics a surgical knife, the ingenious tool cuts through the cape of your game like a hot blade through butter. This is a knife that works fast and smart and when the blade is burned out it can be replaced easily on the fly. 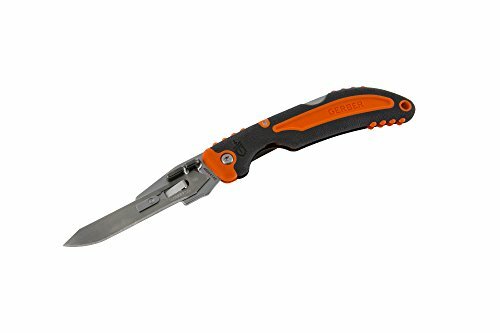 It requires no extra tools for its blade replacement, so it doesn’t slow the action of field dressing, while offering super-safe operation as an exchangeable blade knife. With a bright orange high-visual Vital handle it’s easy to spot if you should drop it while out in the field. The large finger choil and larger width give the knife a solid, comfortable grip. It includes a #60 industry-standard attached razor blade and six #60 replaceable razor blades. Gerber limited lifetime warranty.